I don’t know how many times I’ve embarrassed myself on Facebook. Probably more times than I even realize. Recently, at about one in the morning, I came across a humorous anti-gun cartoon good enough that I thought I’d share it. I wrote a caption to the effect that as long as at least some people on the planet were thinking in these terms, there was hope for humanity. I felt good about myself. The next morning I woke up, opened up Facebook, and the anti-gun cartoon had somehow turned pro-gun. I had posted a pro-NRA gun cartoon and loudly proclaimed this kind of thinking to represent salvation for humanity! So I wrote a comment clarifying my views. Later in the day I looked at the cartoon again and thought, well, maybe it could be interpreted as anti-gun, if you squinted right. When I realized that I could no longer even interpret the cartoon correctly, either due to the ambiguous nature of the cartoon or impending senility, I decided the best course of action was simply to delete the cartoon, which I did. Social media reveals to you what your acquaintances think about all sorts of controversial issues. I am not sure this is a good thing, since it is likely you will then discover that your acquaintances appear to be blithering idiots about this or that issue on which you disagree, which may have a harmful effect on otherwise friendly relationships. When I read that I thought, My God, he’s talking about me. Okay, probably not specifically me, but it could certainly apply to me on occasion. Because sometimes I can’t resist sharing cartoons, essays and whatnot that I think reflect my views. Only they may not entirely reflect my views, either for reasons of stupidity as noted above, or because I’m being flip. Because let’s, um, “face” it, Facebook may not be the best forum for in-depth intellectual discourse, and sometimes (I would even say usually) when I post or share something, I’m doing so without a whole lot of thought behind it. Recently I was called out for this flip-ness. Flipness, it seems, doesn’t translate well on Facebook. People take you literally. A couple of weeks ago I shared someone else’s essay on how modern filmmakers should not eschew analog film in favour of more modern, but more expensive, digital equipment. I agreed with some points of the essay. But I posted it because I like to indulge in a tongue-in-cheek preference for analog over digital because I run a department called Digital Production Maintenance. Sometimes the digital broadcast equipment my department maintains drives us absolutely bonkers with the need for constant upgrades and the software bugs such upgrades inevitably create. I joke that life would be a lot easier if we reverted completely to analog and changed the name of the department to Analog Production Maintenance. But I am joking (mostly). When I shared the essay on Facebook I did not make this nuance clear and at least one friend took me to task for my apparent gullibility. Perhaps others thought the same. There is a real (if slim) chance that such “mis-posts” could potentially even harm my career, were the wrong person to misinterpret such a Facebook post. I have also noticed that whenever I go to the trouble of posting something with a little heft to it (such as this essay), it is usually completely ignored. Whereas when I post an anniversary announcement, or a cute picture of my kids, the “likes” sky-rocket. I am tempted to conclude what most people have probably known from the beginning. That it’s best to play it safe on Facebook. Leave religion, politics and other serious thinking out of it. However, I am not inclined to leave religion, politics, and other serious subjects completely out of it. As Edmund Burke once wrote, for evil to flourish all that is needed is for good people to do nothing. I subscribe to that whole-heartedly. It is not my nature to stay completely neutral, posting only innocuous posts about baby kittens and friendly whales. But clearly I need to modify my approach. When I do stray into dangerous territory, I need to exercise more care. I need to be clear, not flip. I must make sure that I am not misrepresenting myself in any way. Heaven forbid someone should think I’m not in favour of baby kittens or friendly whales. So I’m still not clear — are you for or against digitized handguns? 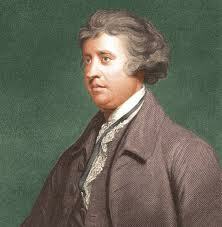 Also, I had no idea you enjoyed making fun of Edmund Burke’s double chin. What Mark said. And happy anniversary. And my students tell me Facebook is so last decade they’re not even reading your cartoons. Just saying. But at least its always clear when one makes comments whether they are being supportive or not. You know,agreeing with you when you were being facetious and such. I just wanted to tell you how much I like the cute picture of the puppy at the top of your page. Mark: Actually, it’s more Burke’s nose I would make fun of. Robert: Thanks! And what is this decade, if not Facebook? Canadan SK: Glad you like the puppy. That’s our dog Maxwell, much bigger but no less cute these days, who I really need to walk right now. Yes, I met said puppy in Norton, N.B. recently. BTW, Canadansk is a contraction of Canada and Dansk: it has nothing to do with Saskatchewan. Cheers! Good advice about what we discover about our friends on FB!